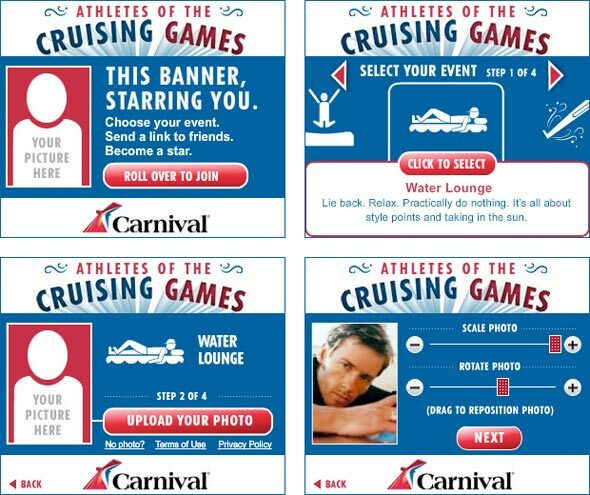 Arnold Worldwide contracted Solarsilk to build a banner for Carnival Cruise Lines where users can submit a photo that will later appear in that banner, live on the web. The banner allows the user to choose an image from his/her computer and load the image directly into the banner. The banner creates a .jpg file and uploads it along with user data to PointRoll. The PointRoll backend pushes the submission into a moderation system. After moderation, the user gets an approval email with a link to a page on NBCOlympics.com where their picture appears in the banner for the world to see.